The Port Desire Notebook needs also to be read in the context of several of Darwin's theoretical essays on geological subjects. Firstly there is the c. March 1834 ‘Reflection' (DAR42) essay, then the c. May 1834 ‘Elevation' (DAR34.40-60). See introduction to the Banda Oriental Notebook for discussions of these two essays. The ‘tail end' of the Port Desire Notebook dates to around the time the ‘Feb. 1835' note (DAR42.97-99) was penned. This note has enormous significance in terms of Darwin's first break with Lyell, on the question of species extinctions (see below and introduction to the St. Fe Notebook). The notebook picks up shortly after the Buenos Ayres Notebook left off at Christmas 1833 at Port Desire in Patagonia. There are various notes and calculations which seem to relate to the heights of plains in pencil and ink inside the front cover. A list of heights dated 2 January 1834 follows on p. 3. This was the date recorded in the Beagle diary when Darwin ‘ransacked' an Indian grave, but there is no mention of this in the notebook. The next few pages are dated 3 January and reflect Darwin's statement in his Beagle diary that he ‘had some very long and pleasant walks'. Unusually he listed the geological section writing perpendicular to the spine on p. 4, but returns to the normal writing horizontal with the spine for the continuation of the notes. By comparing the rocks mentioned (e.g. ‘white Feldspathic Rock' and the drawing of three little triangles on p. 10) these notes seem to link to the page from his geological diary for this time which is reproduced by Herbert 2005, p. 99. Herbert chose this page to illustrate Darwin's technique for recording specimen numbers. The next day the Beagle, having struck a rock leaving Port Desire, moved down the coast to Port St Julian [Puerto San Julián]. See Keynes 2003, p. 188 for a map. Around 9 January FitzRoy landed Darwin who wrote in the Beagle diary that he ‘found some most interesting geological facts'. This was recorded in the notebook on p. 13. Herbert 2005, plate 6, reproduces in colour a hand drawn geological map of southern South America, on which Darwin showed how the geology around Port Desire down to about Port St Julian differs, in being predominantly of volcanic origin, from that of most of Patagonia (DAR41.24). On 10 January Darwin mentioned a ‘Gecko, being kept for some days'. It is clear from his Beagle diary that on the 11th Darwin exhausted himself searching in vain for water and spent the next two days ‘very feverish in bed'. On the 14th Darwin recorded in his Beagle diary that they found a ‘small wooden cross' which might have been a relic of Magellan or Drake, but this is not mentioned in the notebook. Darwin recorded the geology of Port St Julian on the 16th on p. 13. The next day he described the cliff section with, at the top, a layer of mud containing mussels in an extremely good state of preservation ‘60 or 70 feet' above the present sea level, thus indicating fairly dramatic, geologically recent uplift. The mud in places filled channels in the underlying gravel bed and ‘pumiceous mudstone', and in one of these channels Darwin made his last but arguably most important fossil discovery. Unfortunately there is no mention of this discovery in the Port Desire Notebook, but it is important in understanding how Darwin came to believe in descent with modification. The fossil discovered at Port St Julian was the ‘extinct Llama' which Darwin referred to on p. 129 of his Red Notebook in January 1837, after Owen told him that the animal seemed to be a giant extinct llama, hence the new name Macrauchenia patachonica, the name meaning 'big neck of Patagonia'. Darwin had not been able to identify the fossil when he found it, but thought it might be a Mastodon. He was intrigued as to why this ‘Mastodon' had become extinct, as it was obvious from the completeness of the skeleton that the animal was found not far from where it had lived. See Rachootin 1985 for historical discussion, Herbert 1980, 2005 for photographs of the fossils and Keynes 2003, p. 191, for an excellent diagram of the skeleton. It is evident from Darwin's geological diary (DAR33.246) and his correspondence that although he did not know what the animal was when he found it, he continued to call it a ‘Mastodon' for the rest of the voyage. The ‘Feb. 1835' (DAR42.97-99) essay, albeit apparently written more than a year after the find, is primarily a discussion of the reasons why his ‘Mastodon' (i.e. Macrauchenia) was extinct. There was no evidence of it having been drowned by any ‘debacle', indeed the bed of pebbles which might have been taken by some as evidence of a catastrophic flood was actually below the beds containing the fossil. Furthermore, there were no ‘trees or stones' in the bed containing the fossil to indicate anything other than quiet estuarine conditions. The fossil itself was articulated, i.e. all the bones were still arranged as they would have been in the living animal, and this can only occur when the dead animal is covered relatively gently. If any animal had perished while the physical condition of the earth, and the number and force of its foes, with every other extrinsic cause, remained unaltered, then might we have some ground for suspecting that the infirmities of age creep on as naturally on species as upon individuals (Lyell 1832, pp. 129-30). Darwin on the other hand, having seen in July 1834 how apple trees grown from grafts on Chiloé sometimes all die simultaneously (see below), was ready to believe a version of Brocchi's theory as a possible explanation for the extinction of the ‘Mastodon'. Darwin held to his Brocchian position until 1838 and he suggested this in print in his Journal of researches, p. 212. Having thus broken with Lyell in February 1835 on the issue of species ‘deaths', Darwin was ready subsequently to challenge Lyell on the issue of species ‘births'. When in Cape Town in June 1836, Darwin met the naturalist and explorer Dr Andrew Smith (1797-1872). Smith may have bolstered Darwin's belief in the Brocchian extinction theory, by convincing him that large mammals such as elephants could easily prosper on the vegetation now existing in South America, as they do in Africa. So lack of food would not explain the ‘Mastodon's' extinction. Once back in England, in January 1837, Owen told Darwin that his ‘Mastodon' was related to llamas and guanacos, animals peculiar to South America (Journal of researches, p. 209). This seemed to be another example, to add to the several Darwin already knew, of a ‘past inhabitant' found only in South America being similar to a ‘present inhabitant' found only in South America. These speculations, together with Darwin's findings and experiences of geographical distribution, brought about a fundamental break with Lyell on the ‘birth' of species. Darwin may have gradually begun to make this break as the Beagle returned to England from South Africa. This was probably what Darwin had in mind when he used the splendid phrase in his Journal of researches, p. 610, that such cases were 'more pregnant with interest' the more he reflected on them. Macrauchenia is now classed not as a close relative of the guanaco, but as a litoptern, which was an order showing some similarities to elephants, such as the Mastodon, as Owen himself pointed out with respect to Macrauchenia in Fossil Mammalia, p. 35. Judging from the high position of their nostrils, for example, litopterns almost certainly had a trunk. They were also confined to South America and are now extinct (Benton 1990). Llamas and guanacos are species of camel. The closest the field notebooks come to touching on this subject is the single reference, probably written on Chiloé in July 1834, to ‘Apple trees' in the B. Blanca Notebook, p. 83b. The propagation of apple trees on Chiloé is described in Zoology notes, pp. 236-7). Darwin's section for Port St Julian appears with lengthy discussion of the Macrauchenia in South America, p. 95, fig. 16; p. 111, fig. 17. The Beagle returned to Port Desire where on 20 January Darwin recorded a section (p. 15) and mentioned ‘great cliffs nearly 1000ft high' at Cape Blanco [Cabo Blanco] (p. 17). On the 22nd the ship ran down to the Straits of Magellan [Estrecho de Magallanes] and anchored at Gregory Bay on the 29th. Darwin may have done some geology but there seems to be nothing in the notebook, which next mentions Port Famine on 3 February. On p. 19 there is what appears to be a simple diagram of a ‘Winters Bark' tree, that is Drimys winteri (see Beagle plants, p. 177). This is referred to in the Beagle diary for 7 February. 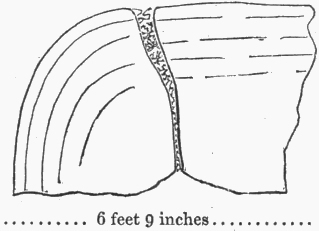 On the 6th Darwin set out to climb Mount Tarn and he drew a diagram of a boulder. He recorded in his Beagle diary that he ‘had the good luck to find some shells in the rocks near the summit' and on p. 25 he referred to ‘animals'. These are probably the fossils, including an extraordinarily large Hamites ammonite, which he described in South America on p. 152 (and appendix). Hamites is from the Cretaceous age, about 100 million years old. Darwin's twenty-fifth birthday passed on 12 February. 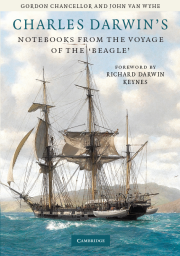 The notebook was set aside for a few weeks while the Beagle explored the east coast of Tierra del Fuego, until she anchored off Wollaston Island and Darwin went ashore on 25 February (p. 26). On p. 27 there is a rare example of a mention of specimen numbers in the field notebooks (geological specimens 1853-5). On p. 28 he recorded that the rocks on top of some hills were ‘not Slate' and this comment found its way into the Beagle diary. This was the time when Jemmy Button was seen by the Beagle crew for the last time and the Fuegian Indians feature prominently in the Beagle diary, but there is no mention of them in the notebook. On 27 February the Beagle anchored off Navarin Island [Isla Navarino], in a position which may be shown in the photograph in Armstrong 2004, p. 63. On p. 29 Darwin made a note about porphyry pebbles being dredged from the sea between Staten Island [Isla de los Estados] and the Falklands. He then deleted the note but the pebbles are mentioned in South America on p. 21. The Beagle arrived in Berkeley Sound on 10 March, providing Darwin with a second opportunity to examine East Falkland. There is no mention in Darwin's notebook of the horrendous events which occurred there before he arrived, although he gave a summary in his Beagle diary. It seems that about four months after the Beagle's 1833 visit, in August, a gang of desperados murdered five of the men living in the Port Louis settlement, one of whom, the first British resident of the Falklands, Matthew Brisbane, was mutilated. This was a bitter blow to FitzRoy especially, as he had come to know and like Brisbane when the Beagle made her first visit, and it was FitzRoy who found Brisbane's unburied body. The remaining thirteen men, three women and two children fled to a small island where they lived on what they could catch until HMS Challenger arrived with marines to round up the desperados. On arrival of the Beagle, FitzRoy had the ringleader clapped in irons for transportation to England (Armstrong 1992, 2004). Darwin made an intriguing note on p. 30 that there are ‘no dung beetles Falkland Islands'. As Darwin was unusually attentive to the ecological dependence of these beetles on large mammals, he may have concluded that the cattle on the Falklands had been introduced. On the same page he asked himself why Tierra del Fuego seemed not to have been elevated in the same way that Patagonia had, and hinted that Falklands geology was more similar to that of Tierra del Fuego. A ‘crazy, very quick' Jackass Penguin (Spheniscus magellanicus) provided Darwin with an amazing human/bird interaction on p. 31 (see also 'Ornithological notes', p. 50 and Journal of researches, p. 256). On the next page Darwin inserted in ink a note that ‘rats & mice & foxes on small islands & Georgia', showing that he was probably trying to work out which animals could reach oceanic islands by natural means. The Falkland Fox or Warrah (Dusicyon australis) was described in Mammalia, p. 7, from Beagle specimens and although now extinct was common enough at the time of Darwin's visits. William Low, a highly knowledgeable Scottish sealer who helped the Beagle in various ways, told Darwin that specimens from West Falkland were smaller than those from East Falkland. See Armstrong 1999, p. 111; Darwin tended to spell the man's name as ‘Lowe', but eventually corrected himself. The information about the foxes impressed Darwin immensely and he referred to it in his famous discussion of the Galápagos mockingbirds in his 'Ornithological notes' of June or July 1836. The Falkland Fox was the only case Darwin was aware of which was comparable to the tortoises of the Galápagos, which were said to differ on closely neighbouring islands. When I was on board the Beagle I believed in the permanence of species, but, as far as I can remember, vague doubts occasionally flitted across my mind. On my return home in the autumn of 1836 I immediately began to prepare my journal for publication, and then saw how many facts indicated the common descent of species. ML1: 367. It was facts such as the fossil mammals from Patagonia together with the Falkland Foxes and the different kinds of birds and tortoises on different islands of the Galápagos that probably stirred such doubts. Once John Gould pronounced the mockingbirds as separate species in February 1837, about four months after the Beagle reached Falmouth, the break with Lyell's view probably seemed to Darwin to be inescapable (see introduction to the Galapagos Notebook). Darwin's serious geological work in the Falklands resumed on 16 March 1834. He was intrigued by the ridge of quartzite hills which run east-west about 10km south of Berkeley Sound, and these dominated his notes. There are also many references to natural history, such as notes on rabbits and foxes, both of which are now thought to have been introduced. Horses behaved very oddly and did not flourish on the islands as they did on the Pampas, hence they were ‘very expensive 100 ps [pesos] each', p. 36. Armstrong 1992 and 2004 has provided an exhaustive analysis of Darwin's two visits to the Falklands. The ‘measurements of curved hills' mentioned on the label of the notebook seems to refer to the Falklands. It is difficult to work out exactly what Darwin meant when he wrote the label but he several times used the word ‘wave' when describing the quartzite ridges so he may have been thinking that the forces which formed the geological structures were in some way analogous to ocean waves, and this appears to be borne out by by his discussion in the geological diary (DAR33.198). In his 1846 paper on the geology of the Falklands Darwin made the startling comparison between some of the structures which he said were ‘almost resembling those produced by the mingling together of two viscid liquids' (Darwin 1846, p. 274). As Armstrong has shown, Darwin certainly thought that earthquakes might explain the mysterious ‘stone runs' and he was open to catastrophic explanations for the contortions of the strata (see especially Journal of researches, p. 255). The diagram on notebook pp. 50-51 seems to be Darwin's attempt to compare the structure of the quartzite hills with the swell of the sea, and on p. 52 he called it a ‘wonderful scene of violence'. The diagram on p. 43 is the prototype for the woodcut (‘fig. 5') published by Darwin in his 1846 paper and the one on p. 47 seems to be the prototype for ‘fig. 1' (Darwin 1846, pp. 271-2). Both are reproduced below. Base of an arched fragment of quartz, East Falkland. Fig. 5 from Darwin 1846. Darwin wrote his much-studied letter to Edward Lumb from the Falklands on 30 March (Winslow 1975, Correspondence vol. 1, p. 378). The last few pages from the Falklands in the notebook, pp. 53-55, are filled with fascinating ecological detail, and Armstrong explained how Darwin spent time examining kelp and its role in supporting an extremely complex web of marine life. This, according to the Beagle diary, was on or about 6 April. The very last entry before the notebook skips forward eight months to November is simply ‘no snakes'. The next dated entry is from Chiloe on 24 November, on p. 56. In the intervening period the Beagle sailed to the Santa Cruz river (see the Banda Oriental Notebook), then down to Tierra del Fuego in May (B. Blanca and Banda Oriental Notebooks), up the west coast to Chiloé in June and July (a few notes in the B. Blanca Notebook) and further up the coast to Valparaiso where Darwin had taken up residence on shore at the home of his old school friend Richard Corfield (1804-1897). From Valparaiso Darwin had commenced his first major expedition in Chile, where the Valparaiso Notebook starts on 14 August. The Santiago Notebook was opened at the beginning of September. At the end of that month Darwin fell seriously ill, being fit to travel again only in November. During these months Conrad Martens left the Beagle and FitzRoy was forced to sell the Adventure and abandon his hopes of perfecting the Tierra del Fuego charts. The alternative might conceivably have led to a mutiny, or FitzRoy's own suicide. This period from August to September 1834 is described in fascinating new detail by Simon Keynes 2004, pp. 159-168, partly on the basis of FitzRoy letters only recently acquired by Cambridge University Library. Several of Marten's sketches and watercolours from Chiloé, made before he left the ship, are reproduced for the first time by Richard Keynes 2002. On 21 November the Beagle entered the harbour of San Carlos [Ancud] on Chiloé and dropped off Darwin who ‘took horse' to Chacao, p. 56, where he planned to join a surveying crew to commence the ‘boat excursion' down the east coast of the Island [Isla Grande de Chiloé]. This and all Darwin's time in Chiloé is described beautifully in Armstrong 2004, chapter 10. Darwin's geological descriptions of Chiloé are in South America; on pp. 27-29 he presented evidence of elevation of the Island, on pp. 120-125 he described rocks and structures, and elsewhere fossils and cleavage, both lines of evidence showing how Chiloé was part of the great north-south Andean belt. The Darwin archive in Cambridge contains his magnificent geological map of Chiloe, sadly as yet unpublished in colour (DAR35.306). The Beagle's chart of Chiloé, which seems never to have been reprinted in any book, is now happily available on Darwin Online here. The manuscript version of the chart formed part of the collection of the late Quentin Keynes. This manuscript map is partially reproduced in Keynes 2004, p. 167. From the first Darwin enjoyed Chiloé, now that it was summer time and not always cold and wet as it had been in July. He thought the indigenous population was superior to what he had seen in the south ‘not very like Fuegians', p. 56. He found the ‘scenery exceedingly picturesque' with ‘beautiful cleared spots & pretty enclosure magnificent forest path like road to Castro'. He had a ‘fine view of Straits of Chacao: Volcano beautiful many crosses, dangerous straits', p. 56. The great snow-capped volcano of Osorno was often admired by the men of the Beagle although they had no idea it would erupt eight weeks later. See Herbert 2005, p. 138, for a fine photograph of Osorno. Darwin was by now confident of his ability to detect crustal instability: ‘everywhere signs of upheaval', p. 57. He noted the superstitions of the people ‘Cheucao making an odd noise people will not start', p. 58, referred to the dread which the call of the Chucao Tapaculo (Scelorchilus rubecula) held for them. This bird, which is referred to in his 'Ornithological notes' as one of a group which he called ‘Myothera', had great significance for Darwin, as made clear to us by Jonathan Hodge, who has generously shared some of his unpublished research with the editors. Darwin encountered various birds which he grouped as ‘Myothera', now classed as members of the family Rhinocryptidae, in various different habitats on mainland South America in 1834-5 (see Herbert 1980, note 154 for details of the various species). What makes these birds so important is that Darwin saw their similarities. This is perhaps unexpected, in view of the significance usually attributed to the differences Darwin noticed in island species, for example the Galápagos mockingbirds. If, as Lyell wrote, species should be adapted to their habitats, there is no reason for them to be similar if inhabiting different habitats apart from heredity. In this sense the ‘Myothera' were more important to Darwin than the rheas (see introduction to the Buenos Ayres Notebook) because in the case of the rheas there was no discernible difference in the habitats of the two species. It is, however, true that it was the rheas which Darwin mentioned several times in the Red Notebook as replacing each other in space in a comparable way to the replacement in time of the extinct by the living species of ‘llama'. Darwin's recognition, albeit perhaps subconscious, that it was heredity linking the various ‘Myothera' – and that adaptation was relative — removed for him any logical objection to descent with modification. What he needed then was to find a mechanism that might cause the modification, and this he first found in the isolation of variants which occurred when barriers were imposed, such as the sea between the islands of the Galápagos. Thus Darwin's first tentative glimpses of descent with modification in living species was of a process which allowed change while retaining resemblances. Chiloé at the time of the Beagle's surveys had only been released from Spanish rule for about eight years and many people there were unhappy with the Chilean administration, to the extent that they hoped the Beagle had come to remove the Chileans. Thus Darwin noted on p. 58 how the now ‘miserably poor' Governor asked him ‘indifferently' if the English ‘flag would always fly'? On the same page Darwin mentions Charles Douglas, the surveyor, who gave Darwin much valuable information about Chiloé (see Correspondence vol. 1, pp. 430-1). On 25 November Darwin traveled by sea with the crew of the yawl and a whaleboat until ‘foul wind drove us in' to a place called ‘Huapilenous' [Haupilinae] on the NE corner of the island. Darwin recorded ‘Torrents of rain & in night Hurrah Chiloe', p. 59. He wrote ‘"Huapi" means Islands: yet now nearly all peninsulas. Proof of rise'. In his geological diary (DAR35.297) he expanded on this point which seemed to Darwin to imply that in the time since South America has been inhabited these islands have risen above sea level sufficiently to become joined up. The present day view is that man only reached the continent about 10,000 years ago so, if true, this rate of uplift would indeed be impressive. On the 26th the boat crews saw ‘Osorno immitting much smoke snow considerably melted, always in state of activity', p. 61. The locals ‘expect earthquake, when no eruption during 1 to 3 years'. There is much fascinating detail in these pages about the geology, the Indians and how the Government kept them in poverty. Darwin seemed to have become seriously interested in the history, languages and religions of the local tribes, much of his information probably coming from Douglas. The boats worked down the coast against a ‘strong foul wind', p. 63, and Darwin made a heavily scored through note of ‘Small Crustacea purple clouds of infinite numbers pursued by flocks of P. Famine Petrel'. By the 28th they were at Quinchao ‘splendid day & clear weather' and the next day Darwin noted ‘many periaguas' which was a kind of boat, and ‘hundreds & thousands' of petrels. See Birds, p. 137 and Journal of researches, p. 354. He was forming the impression that the east side of the Island was covered in enormous quantities of gravel, and on p. 68 there is an intriguing diagram of this gravel resting in steps in the landscape. On p. 70 he recorded that ‘The Nautilus is thrown up periodically in great numbers' along the coast, but gave no explanation. He mentioned that some of the Indians ‘hold converse with the devil in a cave', a crime which would formerly have sent them to the Inquisition in Lima. Darwin and his party arrived at Castro, then the capital, on 30 November and were impressed by the ‘highly picturesque' wooden Jesuit church, p. 74. Darwin ‘rode about in the neighbourhood to see geology' and saw how the conglomerate rested on mica slate. He also heard of granite occurring in the centre of the Island. Pages 77-78 are excised but are now in DAR35.297A. Page 77 gives details, apparently from Douglas, of some recent earthquakes, while the reverse, p. 78, is a whole-page diagram of the various levels in the cliffs at Castro. On p. 79 Darwin referred to a severe earthquake that had occurred on Chiloé. The next day (1 December) the party left Castro ‘early' in heavy rain for the nearby island of Lemuy, and Darwin made a note to remind himself to write a description of the ‘coralles' – underwater hedges, exposed at low tide and used as natural fish traps. He found lignite, that is fossil wood used as low grade coal, p. 82, and a huge block of granite which he supposed came from the Cordilleras. He commented on the three different calls of the Chucao (see Beagle diary, p. 271). The next day Darwin found poorly preserved shells, including a Cythereae (clam), in the cliff but had expected to find more, so speculated that the absence was due to chemicals destroying the shells. They made slow progress and were impressed with the large numbers of ‘purer and purer Indians', p. 88, who were ‘excessively humble & civil'. Darwin found a beautifully preserved fossil tree apparently the same age as the fossil shells. See Keynes 2003, p. 257. On p. 90 Darwin noted the extraordinary behaviour of some beetle species. 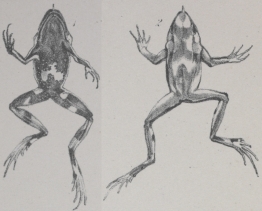 On 3 December he described a splendid little frog and drew a sketch of it, apparently stretched out for dissection, p. 91. This was specimen in spirits of wine no. 1086 and Zoology notes, p. 256 lists it as Rhinoderma darwini and was first named on the basis of Darwin's specimens by Gabriel Bibron (1806-1848). (see Reptiles, p. 48, pl. 20). Rhinoderma darwinii from the island of Lemuy, part of plate 20 from Reptiles. On 4 December Darwin continued to describe the geology and mentioned how Douglas, to protect the crew at night, had simply told the locals that if they went out at night they might get shot! They reached Quelen [Queilen] and on the 5th Darwin found a sea snail, and again we are indebted to Zoology notes, p. 255, for indicating that this is specimen 1092, Onchidella marginata. They pressed on in ‘squally weather' and Darwin told the story of a man who walked for three and a half days ‘to receive value of an axe & a few fish'. On the 6th Darwin found a ‘Doris' and an ‘Eolis' (both sea slugs) of which he attempted crude sketches. From Zoology notes, p. 255-6 it is evident that these are both lumped as specimen no 1091, Anisodoris fontaini and Phidiana lottini respectively. The party finally reached Caylen Island [Isla Cailín], ‘el fin de Christianidad': the most southern point to which Christianity had reached in South America. This fox, more curious or more scientific, but less wise than the generality of his brethren, is now mounted in the Museum of the Zoological Society. The boats arrived back at Isla San Pedro to rejoin the Beagle after an ‘absence of fortnight'. The Beagle had ‘failed in surveying outer coast', but had discovered that previous charts of Chiloé had overstated the length of the island by 25 per cent. On p. 107 Darwin described the dense forest on the island, and ‘walk many feet above ground' was expanded in his Beagle diary for 8 December into a marvelous description of how Darwin and FitzRoy struggled to get to the top of the island by climbing over the fallen trees. From this point Darwin was back on the Beagle and the rest of the notebook is notes and diagrams apparently relating to the Chonos archipelago (see South America, pp. 119-20). The final pages of the notebook are, however, complicated by excised and blank pages and it is extremely difficult to date this part of the notebook. It is not even possible to be sure of the order in which these pages were written. On pp. 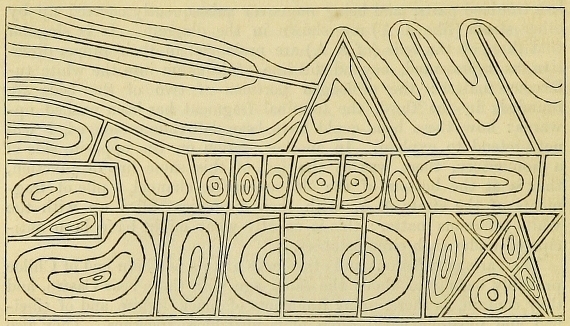 116-117 Darwin drew a 'ground plan showing the relation between veins and concretionary zones' which is copied almost without change as woodcut no. 20 in South America, p. 124 (and below). This diagram relates to the area around Castro on Chiloe, so it seems likely to have been drawn at the end of November. The simple sketch of a hollow concretion on p. 118 seems to be the prototype of the one which appears in the Red Notebook on p. 160. ‘ground plan showing the relation between veins and concretionary zones’ on Chiloe. Fig. 20 from South America, p. 124. There follow pages of calculations, the meaning of which awaits explanation, and on p. 119 Darwin recorded the ‘eruption of Osorno 26th of Jany.' This, however, is written within a penciled box and seems almost certainly to be a later insertion, especially since on that date Darwin was making notes which are now loose sheets, rather than in a notebook, in DAR35.328. This was during Darwin's overland ‘expedition no. 6' across Chiloé which started, after the Beagle had sailed back up the west coast of Chiloé, on 19 January 1835 and ended on the 28th. On p. 121 Darwin recorded a ‘valley of elevation' separating two escarpments tending north-south which he described in South America, p. 124, as being on the peninsula of Lacuy [Lacui], near San Carlos. This would suggest a date around 24 November 1834 for this note, but it may have been made on 19 January 1835. On p. 122 Darwin seems to have calculated the height of the Corcovado mountain by triangulation, and this suggests a date around 26 November, as on p. 128 the wording about a mountain ‘S of Corcovado not known to be volcanic' is similar to the reference in the Beagle diary for that date to mountains in the same direction ‘not known to be active'. Finally, on p. 128 Darwin measured a plant using his belt; this seems to be the Pangi Plant, in the Beagle diary for 26 November. There are some ornithological notes of interest: ‘is the brown vulture found at [South] Shetland? ', p.132, and ‘Huitreu….comes near to a man if he is quiet', p. 133, which became, in Journal of researches, p. 352, ‘let [a man] stand motionless, and the red-breasted little bird will approach within a few feet, in a most familiar manner'. Thus ended one of the most varied and interesting of the field notebooks, which ranged across virtually all of Darwin's interests during the voyage, from zoology, botany and geology to ethnography, history, linguistics and anthropology. It also covered some of the most important episodes in the development of his thinking with respect to the ‘birth and death of species'. Spanning the year 1834, it started in the first half of the voyage on the east coast and ended in the second half on the west coast of South America. In one sense the Port Desire Notebook ‘nests' within the extraordinary gap of use of the St. Fe Notebook, which started in 1833 then jumped to 1835, while the gap in the middle of the Port Desire Notebook is filled by the Banda Oriental, Valparaiso and the first part of Santiago Notebooks. 1 The Port Desire Notebook contains far more diagrams (41) than any other notebook apart from the St. Fe Notebook (which has 46). Since the Port Desire Notebook has less than half the number of words of the St. Fe Notebook, this means that the density of diagrams in the Port Desire Notebook is the highest of any notebook. The notebook also has the second largest number of blank pages, after the Banda Oriental Notebook. See the general introduction. 2 Other notebooks used in the same time period as the Port Desire Notebook are, in order, the B. Blanca, Banda Oriental and Valparaiso Notebooks for the southern winter of 1834 and Santiago which was in use from September 1834 at least until the end of the voyage (see introduction to the Santiago Notebook).